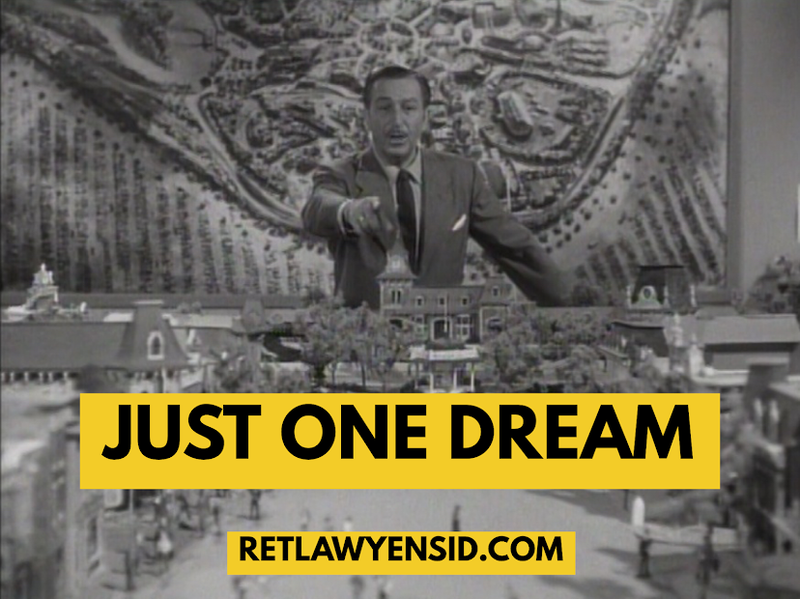 Just One Dream: RetlawYensid.Com: DISNEYLAND: Birthplace of..... Doritos? Many new technologies and entertainment concepts have been introduced or displayed at DISNEYLAND. Tomorrowland in particular has exhibited many technological marvels over the years. However, even in a land like Frontierland which celebrates the past, one can find a history of innovation. For Frontierland was the birthplace of one of the biggest consumer products introduced in the latter part of the 20th century- Doritos tortilla chips. 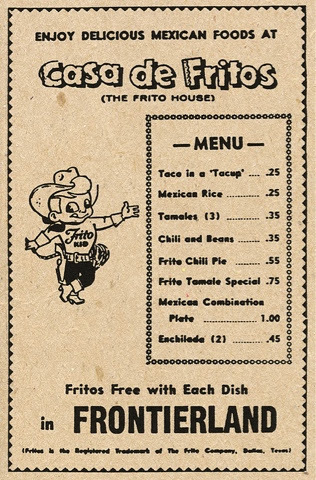 Initially tucked away between The Golden Horseshoe and what is now the River Belle Terrace was "Casa De Fritos", a Mexican restaurant that is often credited for popularizing Mexican food among middle Americans. The restaurant served up Mexican dishes with a free side of Fritos corn chips. Gotta love those prices, right? And what in the world is a "Tacup"? One fateful day, the representative from the company that supplied the tortillas for the restaurant stopped by to check in with park management and noticed that cast members working in the kitchen were throwing away broken tortillas. He advised the managers that they could make extra money by cutting up the broken tortillas into chips, frying them up, seasoning them and selling the resulting product. The chips were added to the menu and became an instant hit. There was one obvious problem, however. The restaurant was supposed to be promoting the sponsor's product- Fritos; not these new spicy chips. 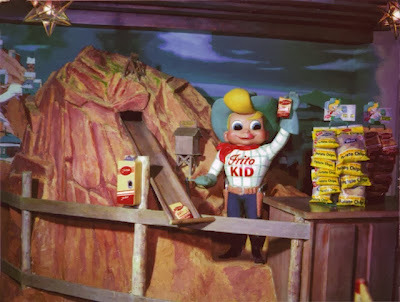 Due to their popularity, however, the management was loathe to remove the chips and merely became careful about hiding their menu item from the DISNEYLAND sponsorship staff. Soon enough, their unapproved menu item would be exposed when the head of Frito-Lay showed up for an impromptu lunch with Walt Disney. He was curious about these chips and made sure to order them. They were an instant hit! Rather than get mad, the head of Frito-Lay saw the opportunity to create a brand new product. Soon enough, the enterprising tortilla representative was signing up Frito-Lay as a new customer and a new product was introduced- Doritos. The chips were a huge success and all because of DISNEYLAND! 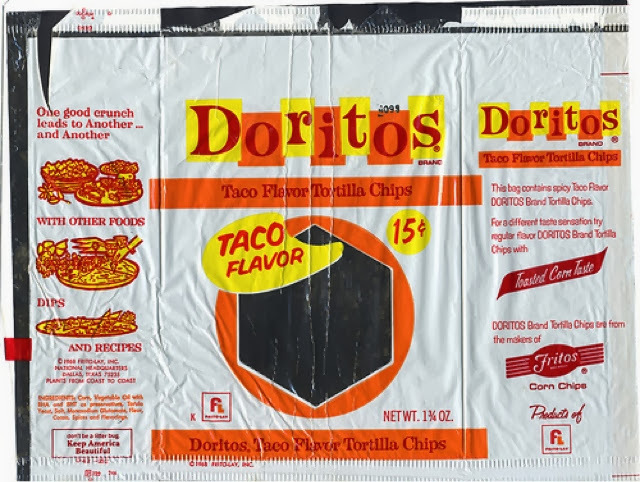 Each day, millions of people open bags of Doritos without knowing that this classic snack got its start at the Happiest Place on Earth. Casa de Fritos eventually became a part of DISNEYLAND history when Frito-Lay ended its sponsorship. Since then, the restaurant has changed its name and sponsors twice and is still a popular place to eat in Walt Disney's Magic Kingdom. Of course, hardly any of the guests enjoying a meal there realize that it was the birthplace of one of the most successful snack foods ever created.